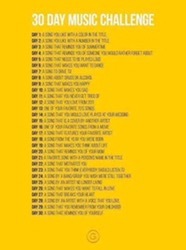 It’s day 2 of the 30 Day Music Challenge I’m taking part in, if you missed Day 1, you can read it here. Day 2’s is “A Song You Like With A Number In The Title”, which was a very easy one for me. Ultravox’s “One Small Day”, you can watch the video here. I love how the group moved from the synth/electronic sounds to something extremely rocky, the start of the song with its guitar lets you know that this is going to be good! The video was a move away from their videos which told a story, it featured the group playing in the cold with some great scenery, they also looked very, very cold! I have to admit that this song is on my playlist for either walking or cycling (it used to be for jogging but #scarfeet prevent that ATM), many a time I have warbled along to this cycling down a hill, lol! I could also have chosen Midge Ure’s song Little One as that is also really good. I’m not sure if he is singing about a child or a lover but it’s a nice song anyway.